ALL OF OUR ITEMS ARE IN MINT TO VERY GOOD CONDITION. CLICK ON ANY ITEM TO VIEW THE ITEMS CONDITION !! *ELVIS YAHTZEE BOARD GAME*. Yahtzee is the worlds most popular commercial dice game. First introduced in the 1950s and still a best-seller today. It is based on a game called *Yacht* and is also related to a Puerto Rican game called *Generala*.To play the game you roll five dice in a effort to make different combinations of the five dice for the most points. Shoot for three-of-a-kind, four-of-a-kind, a full house, a straight, and more. If these sound familiar, is because they are based on standard poker hands, with a few extra bonus hands thrown in. 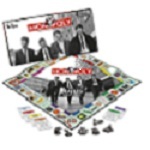 *BEATLES COLLECTORS EDITION MONOPOLY* So may we introduce to you... The worlds most legendary rock-n-roll band teams up with the worlds most popular board game to bring you the ultimate Beatles experience. The *Beatles Collectors Edition Monopoly* celebrates the music that revolutionized rock-n-roll in the 20th century. This game features Apple and Abbey Road Studios along with every album released by the Beatles allowing fans to create their own private music anthology. Enjoy and sing along to the music that has transcended generations as you collect the White Album, Revolver, and more. Six collectible tokens symbolize unforgettable songs. 18 INDIVIDUAL AND DIFFERENT SET OF MAILING POSTCARDS. GREAT TO SEND TO FRIENDS OVERSEAS, OR JUST TO KEEP FOR YOUR MINT CONDITION COLLECTION OF BEATLES ITEMS. THESE ARE VERY RARE AND HARD TO FIND. I ONLY HAVE ONE COMPLETE SET AVAILABLE SO HURRY AND GET THIS COLLECTIBLE ITEM BEFORE IT IS GONE. 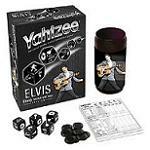 *ELVIS COLLECTORS EDITION* Shake, rattle & roll your way to win this fun Elvis Edition of the popular game Yahtzee. Custom version of the classic dice game features a rock & roll Elvis theme that is a perfect addition for any true fan. Traditional rules let you play a regular game of Yahtzee with a few new designs fit for the King. Custom gray and silver dice feature Elvis icons instead of dots, including: a guitar, platinum record, TCB logo, shake, rattle & roll, an Elvis silhouette and signature. Dice cup with cover provides a convenient way to store your pieces. Details Includes dice cup with cover, 5 dice, chips, score pad & instructions. IF YOU ARE INTERESTED IN THIS ITEM PLEASE E-MAIL US AT WWW.CHU-BOPS.COM AS OUR INVENTORY FLUCTUATES DAY BY DAY.